It appears to me that those jackfruit traditions follow Asian communities abroad, evident in the availability of fresh fruits imported from afar and the rows and rows of canned jackfruit found at Asian supermarkets here in the San Francisco Bay Area. And since the use of jackfruit has diversified into other cooking cultures, such as BBQ jackfruit and jackfruit tacos just to name a few, Trader Joe's has also started selling canned jackfruit! I took this photo of jackfruit displayed alongside watermelons at my local store (above) to show you just how big these fruits can get. A close relative to breadfruit and figs (believe it or not), it is the largest tree fruit in the world and can grow up to 100 pounds! Let's take a moment to imagine that. It takes a village to cut open and eat a whole jackfruit, no joke. The skin of a jackfruit is more like a shell and has a leathery texture best compared to a basketball. When you cut open the green rind, you'll see yellow bulbs divided into segments and surrounded by stringy white fibers. You may find more than a hundred bulbs, each encasing a big seed that can also be used in cooking. Because of its size, jackfruit is often sold in segments, which I've seen at Whole Foods. The most convenient way to enjoy fresh jackfruit is to get just the yellow bulbs, usually packed in plastic and sold by weight (above), but be prepared to pay a lot more. How does fresh jackfruit taste? It's intensely sweet with fragrant notes that have been described as "a mix of banana, mango, and pineapple". In the mouth, it has a slightly firm yet pillowy soft texture. And if that's not enough to convince you, jackfruit is a rich source of vitamins and minerals with high protein and fiber content and no cholesterol or saturated fats. At this point, I should tell you that the much sought after "pulled pork" effect you see in vegan jackfruit dishes comes not from the ripe yellow fruit but its unripe counterpart, which can normally be found canned in brine (below). 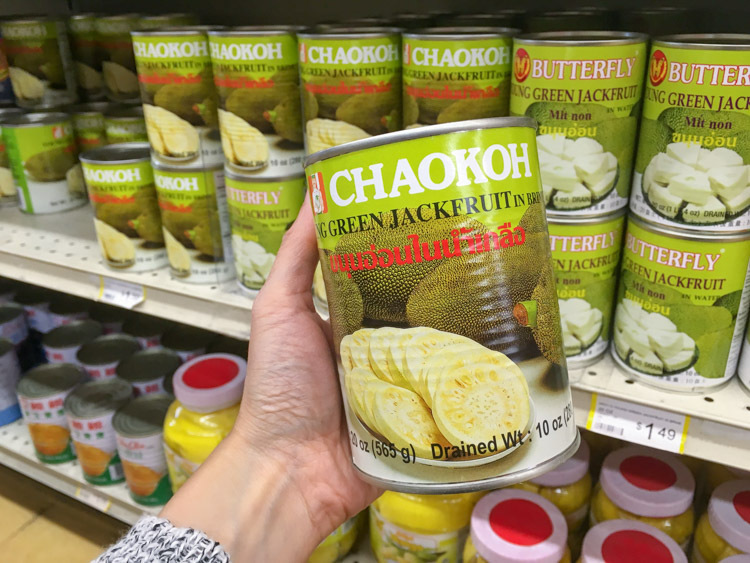 If you shop at an Asian supermarket, you'll probably encounter many different brands and kinds of canned jackfruit. Some of them are ripe jackfruit in syrup, which is what I'd avoid for this recipe. Look for labels that say young, green, unripe jackfruit, and pick the brand with the least amount of sodium (and extra ingredients like preservatives, if possible). I recommend rinsing the jackfruit pieces before cooking to further remove the salt content. Young jackfruit has a bland, nondescript taste and while that works well as a blank canvas in savory recipes, it really is the texture that is prized. As you can see in the photos above, the flesh of pale unripe jackfruit is tough and fibrous. When cooked, it delivers a "meaty" texture with the stringy appearance of pulled pork. 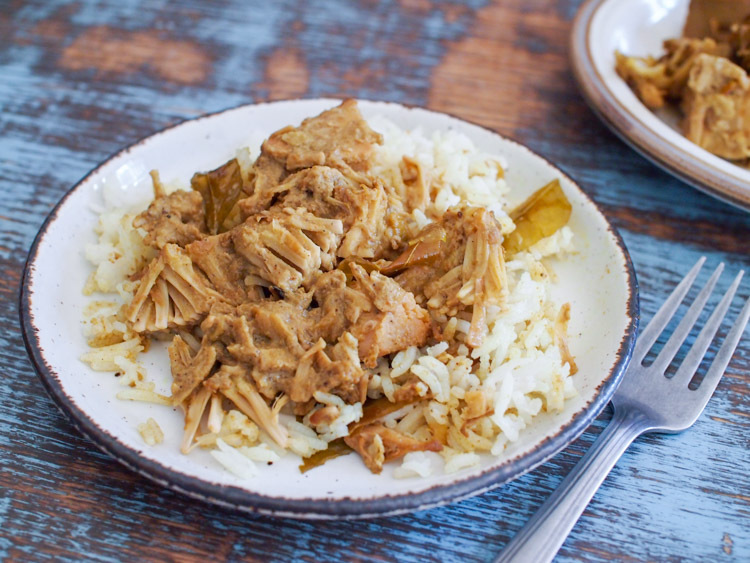 We all know jackfruit is currently a trending ingredient but green jackfruit curry or polos curry has been enjoyed in Sri Lanka long before the trend started. 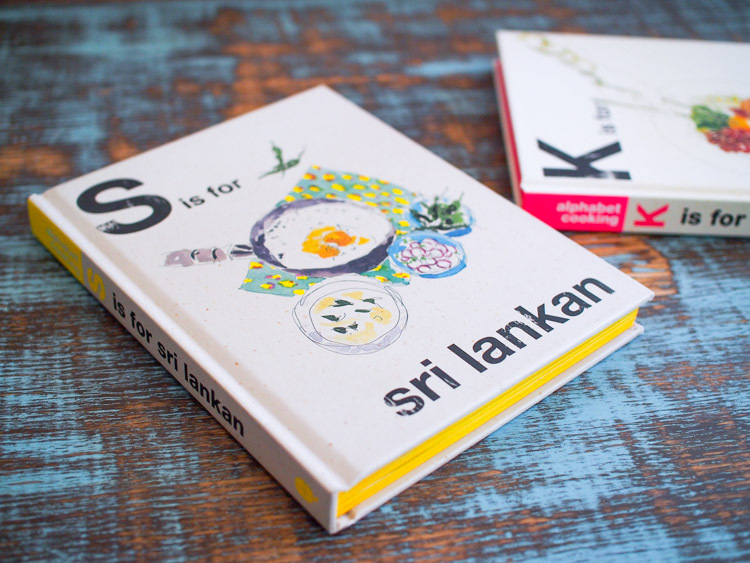 The recipe calls for a Sri Lankan curry powder that lists fennel seeds, cardamom pods, fenugreek seeds, mustards seeds, and curry leaves as some of its ingredients. 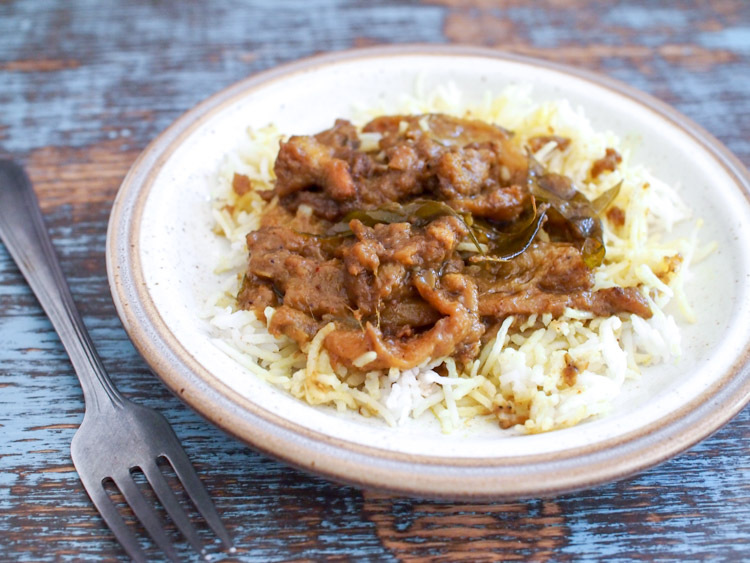 You can tell from the list that this dish has some powerful flavors, which are nicely balanced by the sweet richness of coconut milk and tartness from tamarind paste. Out of curiosity, I made this curry several times, one with ripe jackfruit and another with young jackfruit. On both occasions, the plate was licked clean so I can testify that it worked both ways! However, at close to $20 for fresh ripe jackfruit compared to less than $3.50 for two cans of young jackfruit, it was quite an expensive experiment. The good news is, young jackfruit is what's commonly used in curries and it's cheap and easy to find! The photo above shows the version made with ripe jackfruit. Compared to the other photos of the curry made with young jackfruit, the first thing you'll probably notice is the texture. Soft and quicker to cook, it didn't string like pulled meat. But I want you to know that the taste was out of this world: intense and concentrated with sweet and sour flavors and a welcome hint of heat. The fruity-floral quality of the jackfruit came through and went really well with the pungency of the curry powder. I really loved the presence of tamarind paste here because it rounded up the sweetness of the fruit and cut through the fatness of the coconut milk with a delectable brightness. With young jackfruit, the texture is great (meaty, stringy, and all that jazz) but the curry is unsurprisingly void of any sweetness and has sharper salty (I attribute this to the brined jackfruit), tart, and spicy flavors. I found that adding up to 1 tablespoon of sugar (or more, depending on your preference) actually brought those elements together nicely and improved the overall taste. If you're curious about how jackfruit is traditionally cooked, I hope this post serves as an encouragement for you to try it at home. Remember, canned young jackfruit is inexpensive and this recipe has been proven to win over crowds! Have you cooked with jackfruit? Tell me in the comment section below! Sign up for email updates here and let's stay in touch on Facebook, Instagram, Twitter, YouTube, and Pinterest. 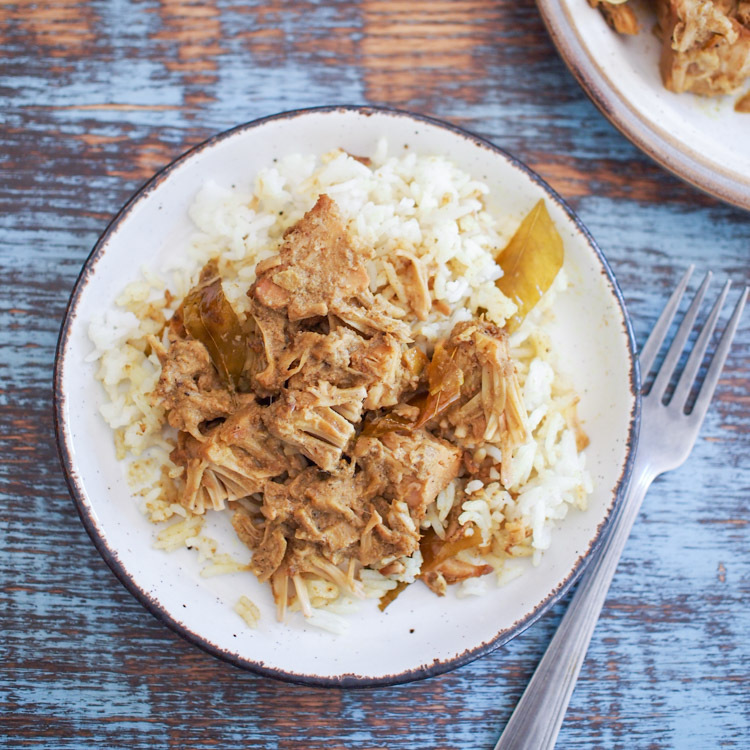 A Sri Lankan classic, this jackfruit curry is made with young jackfruit using an aromatic blend of curry powder. Adapted from S is for Sri Lankan. Serves 2. To make Sri Lankan curry powder, heat all the ingredients in a large saucepan over low heat, stirring frequently to prevent burning, for 10 minutes or until the aromas are released. Transfer to a plate and let cool. Then use a spice/ coffee grinder and grind to a fine powder in batches. It can be stored in an airtight container for up to 3 months. In a large saucepan, heat the oil over medium heat. Add the onion, garlic, ginger, curry leaves, and chili and stir-fry until the onions are soft and translucent, about 10 minutes. Add the curry powder, ground turmeric, and salt, and stir-fry for another 1 minute to incorporate the ingredients. Then stir in the tamarind paste. Add the jackfruit and coconut milk and bring to a boil. Reduce the heat to a low simmer, cover, and cook until the jackfruit is completely soft and the sauce is dark and thick, about 2 hours*. You will also notice the oil separating from the mixture. Season to taste with sugar*. Serve with rice. · Green jackfruit is most commonly found canned in brine at the Asian supermarket. The amount needed for this recipe is equivalent to 2 x 20oz/565g cans (drained weight 10oz/280g). If you come across a variety of brands, get the one with the least amount of sodium. Rinse the jackfruit pieces in water to further remove the salt content. · If you want to try this recipe with ripe jackfruit, remove the sugar and reduce the cooking time. Bear in mind that the texture is softer and you will not get the stringy "pulled pork" effect. · Click here for a step-by-step guide to making tamarind paste.